Location: 1 Creechurch Lane, City of London. Still playing catch up with the long list of projects I have photographed over the past year, here is another from the neglected archives - which really should have received attention much earlier, alas a hectic work schedule prohibited my bringing it to your attention. 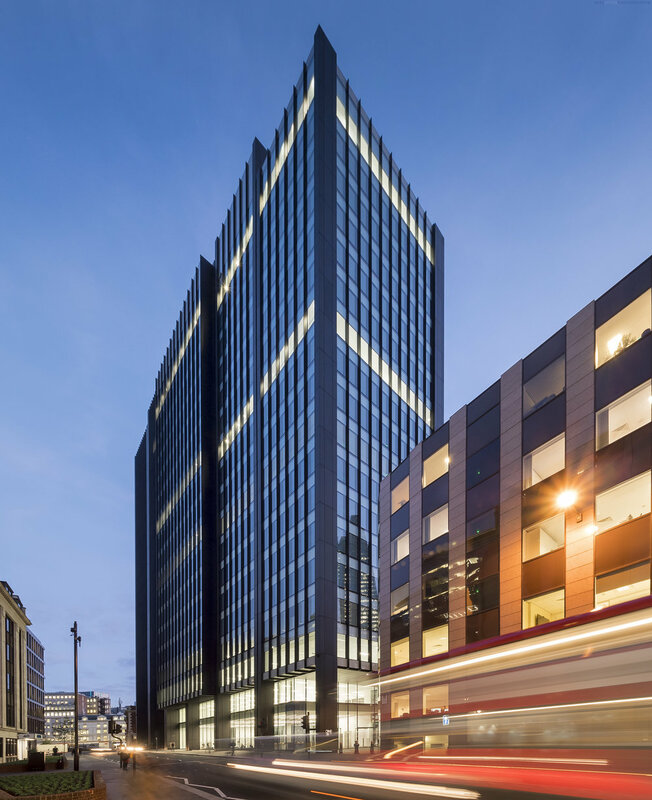 One Creechurch Place is a rather large - 25,315 sqm to be precise - modern, office development located on the eastern edge of the City of London. While not yet obtaining a fancy epithet of its own, unlike those imaginatively designated to the company it sits in; The Scalpel, Gherkin, Cheese-grater et al. the building is just about large enough at 18-stories to make its presence known. Designed by London based architectural practice Sheppard Robson the building was completed in late 2017, which is around the time when I was commissioned to photograph the project. To disperse the buildings bulk it takes on the form of a cluster of towers varying in height, each adorned with horizontal and vertical fins which deviate in their rhythms of appearance. This external matrix tracing the facade lends the building a modernist aesthetic reminiscent of GMW Architects 1969 building, St Helen’s Tower, also know as 1 Undershaft, which is located just a short walk away. As can be seen in the above photograph a canopy is created over the main entrance where just beyond a public space exists, this area hosts temporary installations and sculptures as part of the City of London’s cultural programme. According to the architects Sheppard Robson the building’s ‘principal cladding system is a unitised, interactive double skin – a double-glazed inner layer, single-glazed outer layer and an operable blind in the cavity between.’ Which ‘allows control of solar gain and optimises natural daylight within the offices.’ It is environmentally friendly considerations like this that enabled the development to achieve a BREEAM ‘Excellent’ rating, keeping it in line with the innovative requirements needed of new buildings in the City. Moving Internally the building features a number of perks for the tenants, with the lobby area accommodating a cafe and the basement floors housing high-quality changing rooms, shower facilities and a generous parking facility for bikes. The buildings refined external austerity makes it a somewhat humble addition to the City of London’s ever evolving skyline, which to date has been a breeding ground for a cacophony of architectural peculiarities each trying to out compete each other to gain the crown bestowed on the most irregular form. One Creechurch Place has been designed within the boundaries of height restrictions that need to be adhered to for its location, making use of subtle shifts in form to accommodate this, while still maximising floor-space for the developer Helical. It maybe be that more reserved additions like this to the City will help balance out the skyline, making it more coherent and less flamboyant.